Just when I thought I had researched EVERYTHING about sleep training, I realized I was going to need a solid game plan for travel after sleep training. Check out my methods below for keeping sleep training intact while on vacation. Regardless of how you choose to ‘sleep train’ your baby, sleep training is an emotional time. Everyone is tired and cranky, and sleep training methods can be a soul-sucking endeavor. Our first son was a TERRIBLE sleeper. I am only now able to say that with confidence after having my second son, who by comparison sleeps AMAZING. For our first son, we followed ‘The Ferber Method‘ (otherwise known as ‘Graduated Extinction’ or ‘Graduated Crying’) to sleep train him. I have no regrets on that front and am far away enough from that stage now that I realize agonizing over it was absolutely not worth it! When we finally made it to 8-12 hour stretches overnight (compared to 1.5-hour stints) we were ECSTATIC. The thought of going ANYWHERE and ruining that magic was terrifying. 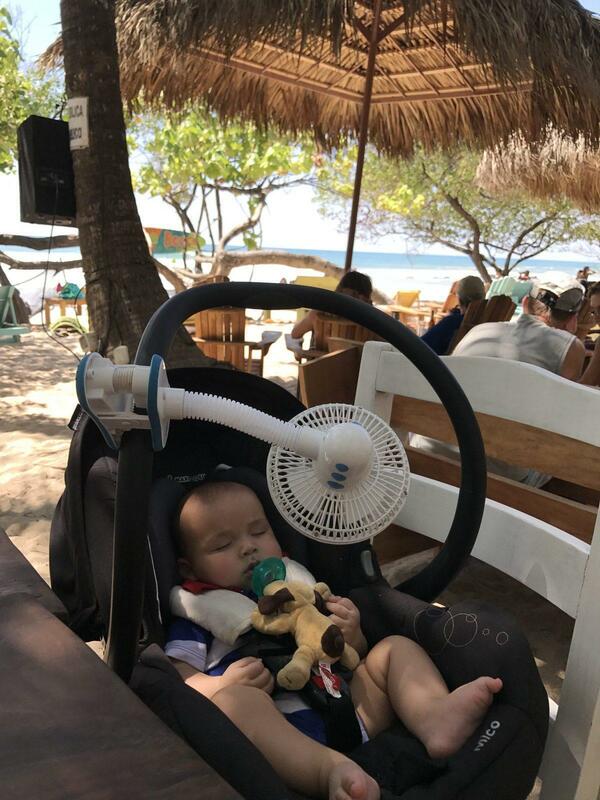 Since we love to travel, we had to muster up the courage to take our son out of his carefully constructed sleep environment (white noise + blackout curtains + routine) to a totally new place and hope for the best. We’ve had a few hiccups associated with traveling (and illness) but overall we never had to do a complete reboot of sleep training again. Here are my tips for keeping your child sleep trained while away. I think just about every sleep training method out there emphasizes a ‘sleep routine’. For us, the routine is: brush teeth, story, lights out with a cuddle and kiss goodnight. It’s not very long, and it’s easy to do ANYWHERE. Bath isn’t part of our regular routine, and this is partly because I knew we would be traveling places where this wasn’t going to be possible. We often travel with our portable blackout curtains, noise machine, and toddler alarm clock. I want the room to be as CLOSE as possible to our home environment. For my eldest, I even brought along a travel toddler bed/playpen everywhere because I wanted it to be the SAME playpen he had ‘practiced in’ at home. Our youngest son is so much more flexible than our eldest in terms of sleep environment. 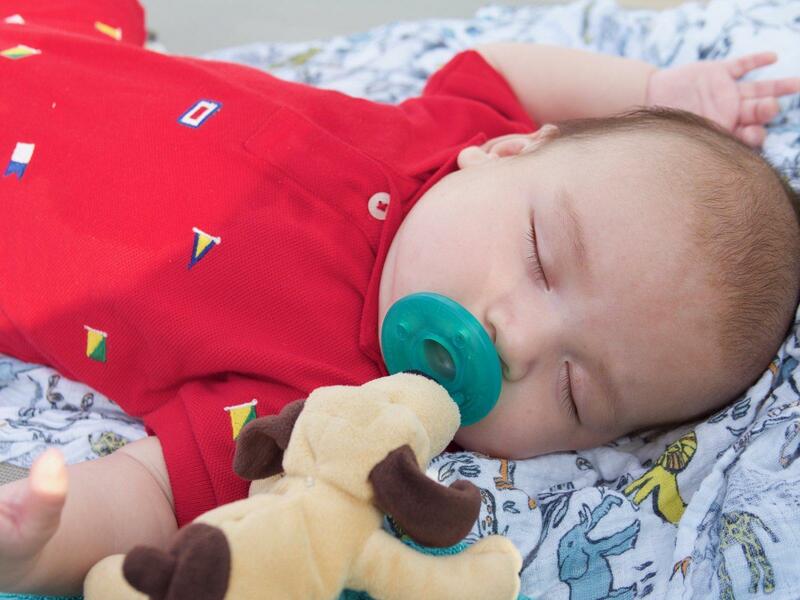 As long as he has his soother and sleep sack he will likely sleep ANYWHERE. This is probably dependent on the kiddo, but for us, sleep training naps was always a bigger struggle. I knew that on vacation naps could involve a lot of crying. Thankfully my son is an awesome stroller/car seat/baby carrier ‘on the go’ napper. 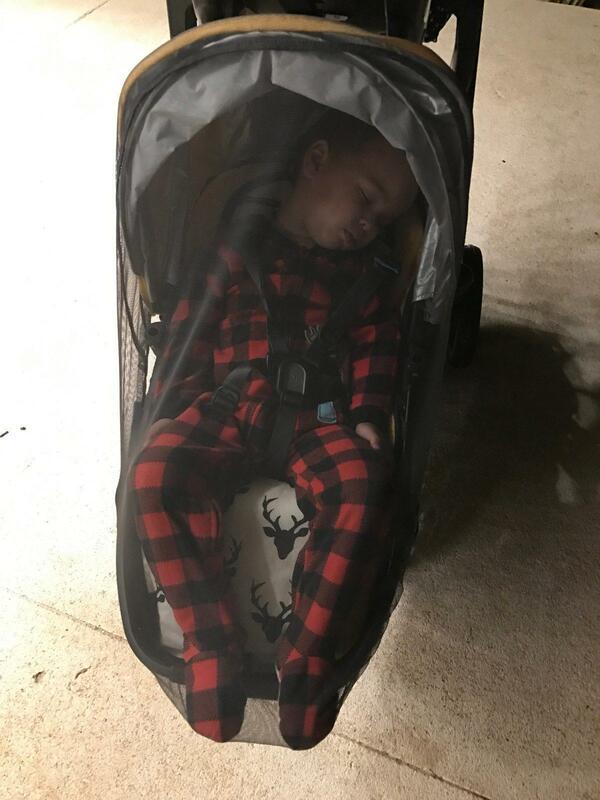 Since I wanted to avoid a meltdown at night I made sure naps happened in the stroller if possible so that we didn’t have to struggle with a huge meltdown. Once sleeping at night in the new environment was successful the naps in the room seemed to fall into place as well. The reality of sleep training for most babies is that there will be some hiccups along the way. There were a few times with sickness or travel that we had crying at bedtime after sleep training was done. Often it was the first night of something ‘new’ and a few minutes of crying would solve the problem and bring us back to sleepy bliss. We traveled at 12 months (LONGGGG after our first was ‘sleep trained’) to an all-inclusive resort. We were essentially staying in a hotel room and we had neighbors in close proximity on either side. This meant that when our son woke up at 4 am crying, we had no option to ‘let him cry a little’ to see if he would settle. He probably would have settled in less than 10 minutes but I couldn’t risk waking up the poor neighbors who were trying to enjoy their vacation. So instead I put our son in the baby carrier and paced the hotel room. For ONE HOUR. Every night at 4 am. Of the ENTIRE trip. It sucked. My experience is that babies, especially difficult sleepers, need a little time to adjust to a new setting. It’s really tough, and likely rough on them, if you can’t continue what you were doing before. 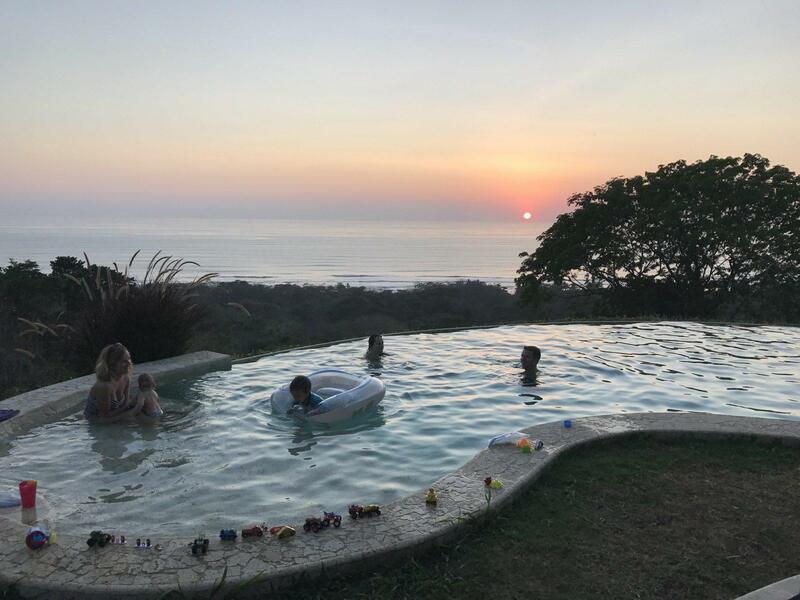 We wish we had stayed in a house/cottage/villa for that trip so we could have given our son a chance to settle on his own using the methods we had previously used and were comfortable with. ps – In case you were wondering, when we got back home, everything went back to normal as if that blip hadn’t ever happened. Again, this is easier said than done. We knew that for our first we NEVER wanted to go back to ‘rocking’ or ‘bouncing’ again. Seriously, every time I see an exercise ball my heart still drops a little. So even though we couldn’t 100% keep to our strict routines when traveling, we only used ‘sleep hacks’ or ‘sleep associations’ we were ok with. We used the stroller, car rides, and baby carrying for my eldest son because those were things we still occasionally did at home. My youngest we actually sleep trained WITH a soother. I know most of the books say not to do this, but hey, it worked out fine for us. He was always a great sleeper, and really only needed gentle sleep training to get his sleep habits in order. Getting him off the soother now (at almost two), well that’s another story!! Our first trip with our little one was the Bahamas at 3 months old. This was before we did any form of sleep training. Although I can’t say we got much sleep on this trip, it was good that we got this trip out of the way before we started sleep training. I would recommend waiting at least 4 weeks for sleep training to be well established before traveling. Don’t let the baby stay up late! Every time I go on vacation I am always blown away by all the little ones who are up at 10 or 11 pm. Perhaps they have a time change to account for the late nights because there is NO WAY my kids could stay up that late and not be MISERABLE for the next 7 days straight. Even on our Disney cruise, I was amazed that the shows all started so late, and fireworks were at 10 pm!! My kids need sleep. I need sleep. We don’t stay up late on vacation! 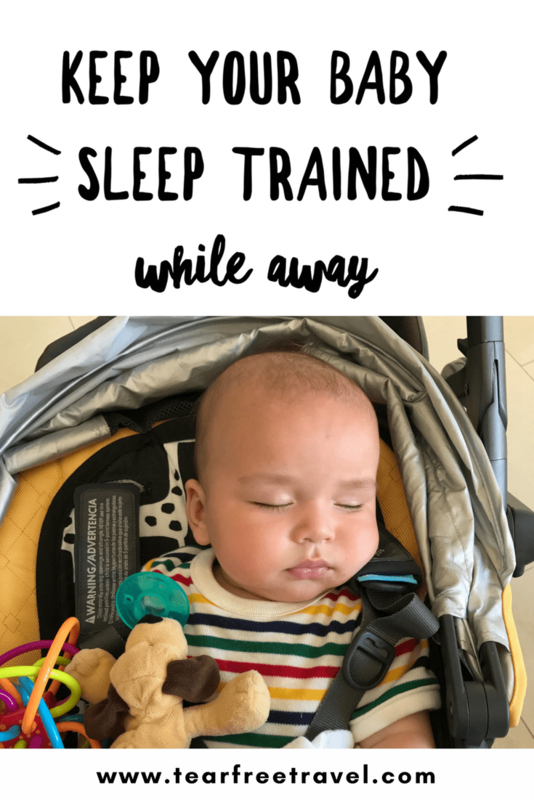 Check out a few more tips I have for Getting My Kids to Sleep Anywhere. Have you done some sort of sleep training? How did it go when you traveled? Any tips? Drop me a line in the comments to let me know how it was!